Timeshare companies make a big part of their incomes out of timeshare sales. It is very profitable to them, since each company can sell hundreds of rooms to different owners. If every timeshare unit has an average purchase price of $15,000 USD; just imagine how much money the resorts become from the timeshare sales plus the annual fees every owner has the obligation to pay, it is extremely lucrative for a timeshare resort to sell timeshares, that’s why they insist persistently to people to attend to their timeshare presentations. Unfortunately, the grand majority of the timeshare sale are made under high-pressure sales tactics, and that is one of the biggest complaints timeshare scam victims have. Figure it out, why would a timeshare company give you fantastic gifts and free meals just to attend to a timeshare presentation? Very simple, they will do everything that is possible to sell you a timeshare during a 4 hours presentation. Is the free breakfast worth it? Think about it. Besides the timeshare resorts, there are also many resale companies. 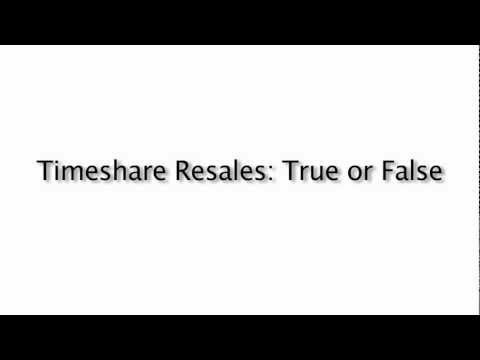 Timeshare resale scams take millions of dollars every year. According to Lois Greisman, Associate Director at Federal Trade Commission, there are tens of millions of dollars being bilked from people who are trying to sell their timeshares. Many of these are “ghost companies” and as soon as they get an upfront fee, they disappear. If you think it is difficult to sell a house, try to sell a timeshare: it is almost impossible. If you surf on the internet, you will find hundreds of timeshare sale listed on sites like EBay, RedWeek or Craiglist for the unbelievable price of one dollar or even less. This fact reflects the desperation of many owners to get rid of their timeshares. For every prospective buyer, there are about 600 owners looking to sell their timeshare in America. Unluckily, timeshare sales are not a good option to dump a timeshare. Selling a timeshare is not only difficult, but tremendously hard. Timeshares are overvalued, and in addition to that, they lost over 70% of their cost when they are first acquired. That means there is no possible way an owner can make a profit by selling his timeshare, or even sell it for the same purchase price. Timeshare sales can be also seen from the prospective buyer’s perspective. For those who are looking to buy a timeshare, it is highly recommended in several timeshare websites to buy the property from the resale market. When deal seems to be too good to be true is because it probably is. These days it is very probable to buy a timeshare in a beautiful destination for a very low price. What the prospective buyer has to keep in mind is that by buying a timeshare, he has to assume the responsibility to pay the annual fees that are charged every year by the resort. Those fees do not stay fixed; in fact, they keep on rising each year. Also, the timeshare can be only used in a specific week of the year (usually in low seasons) and you cannot trade the location unless an upgrade is paid. Buying a timeshare is not an inversion, not even from the resale market. A timeshare is nothing but an expensive purchase that brings forth lots of problems and expenses. No matter if a timeshare is acquired directly from the company or in the resale market. Timeshare sales are never good news. While timeshare companies are only trying to sell their units without thinking on the consumer’s rights, the desperate owners are hoping to find someone that releases them from the annual fees. In you are stuck in a situation where you don’t know how to get rid of your timeshare, in Mexican Timeshare Solutions we offer you a free consultation on your timeshare matter, and we do not charge any fees until your contract is properly cancelled. Contact MTS today for a free advice and release yourself from your timeshare issues. Vacationers will go on vacation without any intention of buying a timeshare and just get caught up in the moment and mess up. These people know very well how to close the sale. Es inevitable sentir frustacion al leer algo sobre tiempos compartidos , tuve una expericnecia muy mala hace unos años al comprar unas semanas en un resort, todo iba bien , pero llego un momento en que me pidieron hacer que renovara si no tendria que pagar una cantidad mas elevada , no pude hacer nada y tuve que pagar ya que en el contrato asi lo decia, una verdadera pena..
Timeshares are a scam. I bought one 10 years ago and have regretted it ever since. It is nearly impossible to trade it for someplace you want to go, when you want to go. When you throw in the maintenance fees and the mandatory membership fees for Interval International or similar, the cost is higher than a hotel. Perhaps when the hotel costs were the largest expense for a vaction a timeshare made sense. Now that air travel is the largest expense and booking packages on line give you the best deals, timeshares are useless. sometimes you cannot prove the fraud and that's the difficult part, it's just another way to make you feel confortable with buying, but don't believe in that, it doesn't work! This could well be true but I’ve not seen a system in place to show people the difference between a legitimate operation and a scam. In Mexico, in my experience, the scams are rampant. Not knowing how to tell the difference, I avoid all time share pitches. Timeshares mean vacationing in the same spot every year. Boooooooooooooooooooooring.